I probably should have done the gear post a long time ago but gear scares me. OK, maybe not scare, but there’s just so much. When I first started backpacking I bought The Ultimate Hiker’s Gear Guide by Andrew Skurka. It was terrifying. A little too ultimate. Where was the Guide to Buying Backpacking Stuff When You Have Absolutely No Idea What You’re Doing? I’ve definitely acquired knowledge along the way but there’s still so much out there. I do an obsessive amount of research and still have a million questions. But here is the basics of what I’ve settled on for the start of the AT. Osprey Aura AG 65 Pack: Since I have the women’s XS pack, and will also be hiking without the pack brain, my pack is more like 56/57L. Packs are pretty much the only item I didn’t research and just went in to try on and talk to someone about. REI had a special on this pack and it felt good on my back and that was that. 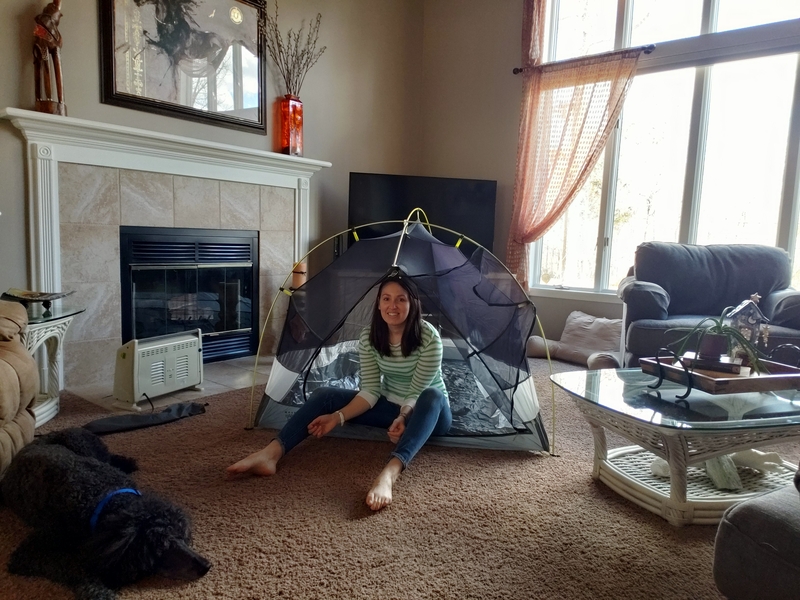 Mountain Hardwear SuperMega UL 2: I’m pretty sure this tent is discontinued but, so far, it’s served me well. Mountain Hardwear Laminina Z Flame 21 sleeping bag: The Mountain Hardwear Laminina sleeping bags are some of the best-rated synthetic bags I could find. The biggest downside is that synthetic weighs more than down. I hope it’s a good choice for the AT since the AT is so wet and synthetic dries faster. For the future I plan to do more research on lighter, down options. Mountain Hardwear Laminina Z spark 34 sleeping bag: More or less a lighter bag with less fill that I can use once I hit Virginia. Therm-a-Rest Z Lite Sol sleeping pad: I cut off some of the panels to make it a bit less bulky. Sawyer Mini Water Filter: Tested at home but the AT will officially be this water filter’s maiden voyage. I heard it has a slow flow rate. We’ll see how it goes. Stove: My hiking buddy is carrying our stove and I’m not sure what it is. Lululemon Wunder Under Tight: Or something similar. I’ve been hiking in Lululemon pants forever. I might be wrong about the exact ones that I use but their stuff lasts so long that by the time I need new ones I forget what I had. Under Armor Long Sleeve: Not sure the style; I bought it a long time ago. It’s lightly fleece lined and has worked pretty well for me in the past for trips with colder nights. Gloves: Actually glove liners but they work. Black Diamond Trekking Poles: Not sure the exact ones because they were a gift but these look pretty comparable. Book: Jane Austen’s Pride and Prejudice is one of my favorite books so I decided it’ll be the first book to come with me. I left out a few little things but this is more or less it. Just a few days left. Here goes! Hi Kristen, I’m a good friend of your dad. Good luck. I’m curious why a trail running shoe vs a hiking shoe or boot. Hi Barry, thanks for following along! Trail runners are much lighter than hiking boots so it cuts back on the effort. They don’t last as long so I’ll go through several pairs on this trip but totally worth it; I have so much more mobility. What about tech stuff…? Taking a real camera… Use your phone… iPad/tablet… Battery pack to recharge…? You’re right, I left that out! I am bringing a cell phone which I will use as a camera and an Anker portable charger.